Last night on Twitter I set the Derek fans a challenge to find out if Dougie was right - did the Chinese factory actually turn off the machines after making Fred the Frog? Well, they've either turned them back on again after seeing Derek, or they never switched them off because Iain Mac (@Iain17Mac) completed the challenge last night and found the only online shop in the world that sells them. They are only on sale in Japan and they come in a pack of two - frog and baby frog. 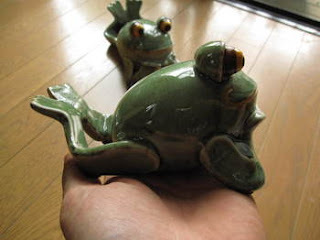 Fred the Frog is available to buy! The website is rather lost in translation as the description is: "As for ornament lying on one's stomach parent and child frog this, the frog is froglet" but I'm going to test the site and order me a pair - every tadpole needs a frog! It's not really right for me to put the link online just yet, as I'm not endorsing this website and as far as I know they could be trying to scam you out of £42! So this makes me wonder, as the original owner of Fred where the hell did you, Karl Pilkington, get his from? Karl, if you're reading this, please leave a comment in the box below! 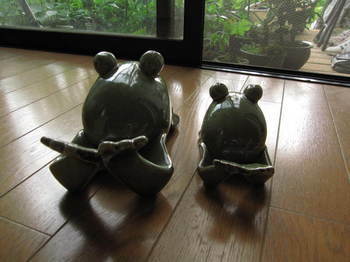 Just wanted to say - my brother lives in Japan and he ordered these guys for my fiancee and I. They're the real deal as far as I can see. If you want one for your own collection, order away. 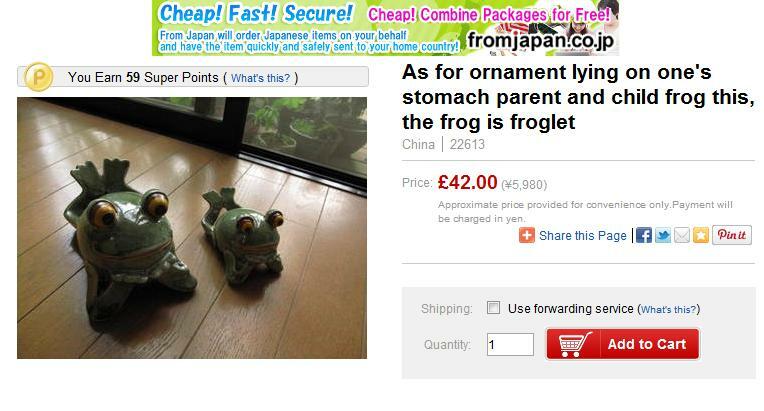 I really want this frog. Does anyone have any more info? Wondering if anyone else has purchased from this site or found them on another site?